Along with a billion other users this year, I upgraded my computer to Windows 10. Not only was the upgrade simple, requiring zero effort on my part and zero inconvenience, it has already changed the way I study and write sermons. In a good way. For the past few years, ever since Google Docs got good, and since I no longer had MS Office paid for by the church I worked for, I’ve been doing all my writing via Google. Google Drive came along and made it even simpler to use Google Docs and Google Slides instead of Word and PowerPoint. I was content with these products and enjoyed the improvements Google made along the way. However, Windows 10 represents the latest milestone in Microsoft’s strategy to provide seamless file management and editing in always-backed-up, cross-platform cloud storage. This was well under way already when Windows 8 was released. But at the time, I still found Google Drive much easier to use. But now Microsoft has convinced me to make the switch. 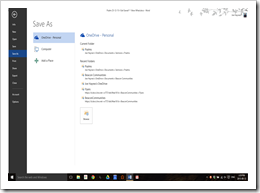 Office 365 is now both affordable to try and easy to use. 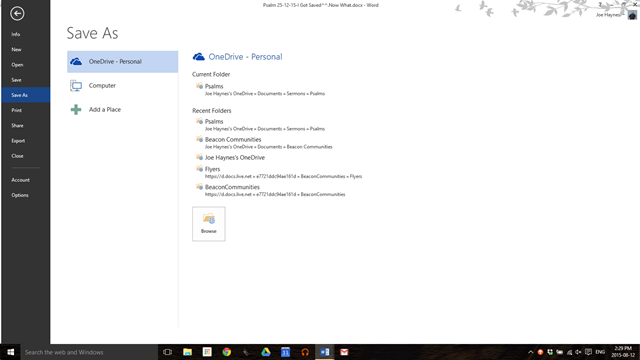 Windows 10 makes integration with OneDrive a piece of cake. So now, though I still have Drive installed, and still use it for storing many of my files, I’m not using it at all for sermon prep. Using Word, when I click to save the sermon document I’m working on, it gives me a link directly to OneDrive, where all my sermons are backed up constantly and available on my Android phone or tablet using the Office apps from Microsoft. I know BibleWorks has released version 10, but for now, still using version 9, I can easily set it up to store all of my personal notes in OneDrive so that they can be recovered any time in the future. Gone are the days when a hard drive failure, OS upgrade, or BibleWorks upgrade meant time lost trying to backup and recover my hundreds of notes files on various chapters of the Bible. In the Notes Editor (I have it set up in the middle column of my BibleWorks layout), hovering over the little yellow file-tree icon shows the hint, “Choose Notes Dir”. Clicking this, I browsed to the OneDrive folder on my computer and created a new folder called “BibleWorks”. That’s it. I have used OliveTree since the days of the Palm Pilot. 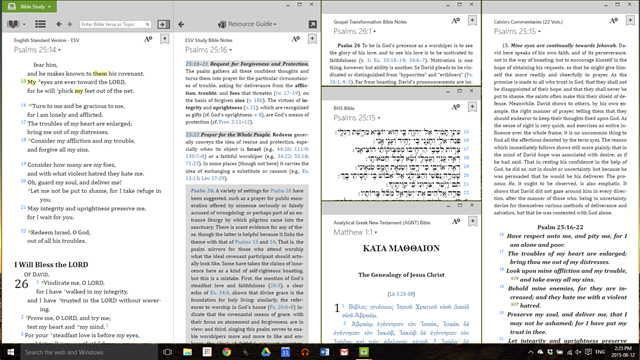 With version 6 of the app for the Windows Desktop, this software finally works well allowing me to add windows for all the commentaries and Bible versions I want simultaneous access to while studying. In this screenshot, I have the ESV Bible open in the left column, the ESV Study Bible Notes in the next column. Beside it to the right, at the top I have the Gospel Transformation Study Bible notes. Below that, I have the Hebrew (BHS), and below that, the Analytical Greek New Testament. If I’m studying in the New Testament, the Greek window will scroll along with the ESV window; if in the OT, the Hebrew will do the same. Then on the far right of the workspace, I have Calvin’s Commentaries open. Many of these features don’t require Windows 10 and are not particularly unique. 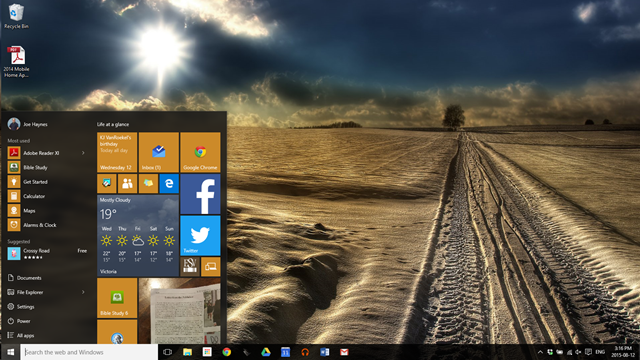 But Windows 10 has added a streamlined desktop manager that makes it handy to use all these tools at the same time. Pressing Ctrl+windows key+D opens a new desktop. So in the example pictured here, I can do that and then open BibleWorks, then using another desktop, Bible Study 6, then Word, and so on. The screenshot shows the running desktops at the bottom of the screen, showing the apps already open on the selected desktop. 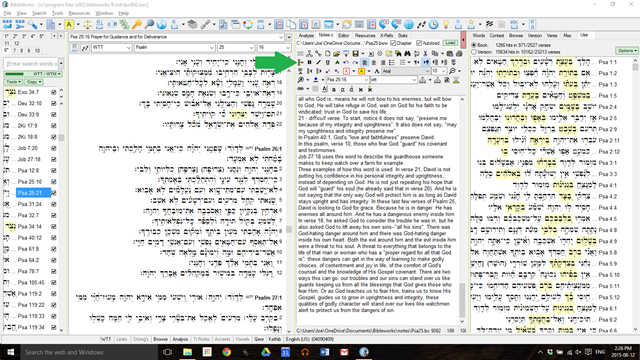 What I love most about the desktop feature, is that pressing ctrl+windows key+[left or right arrow] neatly slides between open desktops, switiching me from BibleWorks, back to Word, or Bible Study 6, etc. 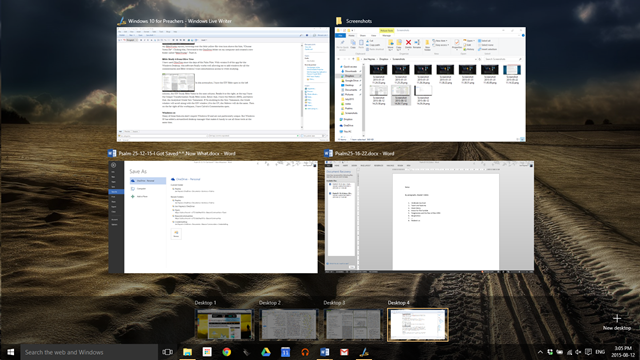 That’s how I’m using Windows 10 with my Bible software and Office to study the Bible and write my sermons every week. Do you have other Windows 10 tips to share? Leave a comment below and join the discussion. 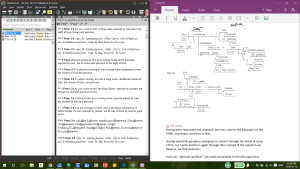 I now have BibleWorks 10 running on my ThinkPad and I love the new tools, theme options and collapsible frames. 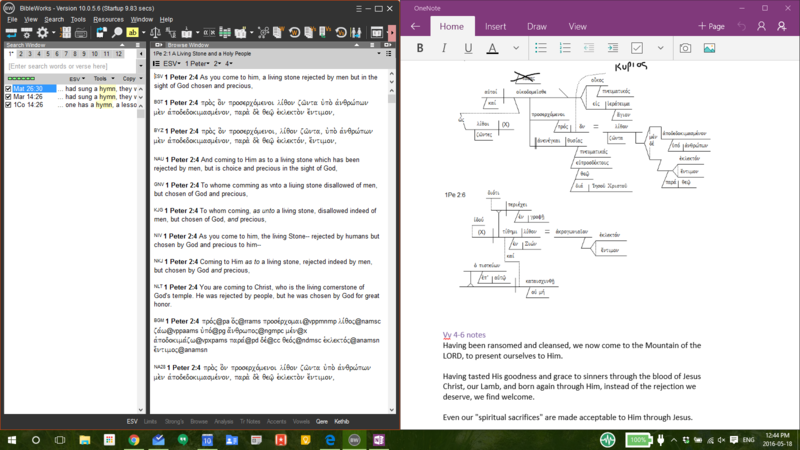 I’ve found it really convenient to snap BibleWorks to one side of the screen while snapping OneNote to the other. Snipping a Greek syntactical diagram from the Leedy module and pasting it into the top of my current sermon file on OneNote gives me access to that diagram and all my subsequent notes on my phone or my tablet.